Washington, D.C., the capital of the United States is located in the mid-Atlantic region of the U.S. East Coast and had an estimated population of 672,228 as of July 2015. The Potomac River forms the District's border with Virginia and has two major tributaries: the Anacostia River and Rock Creek.The District has 7,464 acres of parkland, occupying about 19% of the city's total area. Are you attending the American Geophysical Union (AGU) Fall Meeting this year in D.C.? Don't miss these presentations from staff and partners from across the CASC network! A carbonatite here, a glacial moraine there, a zig-zagging fault or two, even a behemoth of a batholith. The geology of the 50 States is an enormous patchwork of varied forms, beautiful in their variance but challenging to present as a single map. Phillips, Scott; Blomquist, Joel D.; Phillips, Scott; Blomquist, Joel D.; Bennett, Mark; Berlin, Alicia; Blazer, Vicki; Claggett, Peter; Faulkner, Stephen; Hyer, Kenneth; Ladino, Cassandra; Moyer, Douglas; Muir, Rachel; Noe, Gregory B.; Phillips, Patrick J.
Phillips, Scott, and Blomquist, Joel, eds., 2015, U.S. Geological Survey Chesapeake science strategy, 2015–2025—Informing ecosystem management of America’s largest estuary: U.S. Geological Survey Open-File Report 2015–1162, 43 p., http://dx.doi.org/10.3133/ofr20151162. The National Capital Region Network has identified amphibians as a priority taxonomic group for its Inventory and Monitoring program. Amphibian monitoring was initiated in 2005, and is currently concentrated in Chesapeake and Ohio Canal National Historic Park (CHOH) and Rock Creek Park (ROCR), with stream sampling also occurring in Prince William Forest Park (PRWI). This project focuses on understanding the magnitude and variability of extreme storm impacts on sandy beaches. The overall objective is to improve real-time and scenario-based predictions of coastal change to support management of coastal infrastructure, resources, and safety. This research seeks to objectively determine the relative risks due to future sea-level rise for the U.S. Atlantic, Pacific, and Gulf of Mexico coasts. 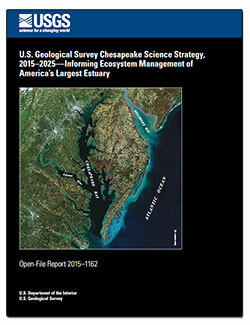 Research is part of National Assessment of Coastal Change Hazards project. Goals of this task include developing and improving coastal-change assessments and supporting long-term planning and decision making to ensure sustainable coastal economies, infrastructure, and ecosystems. Research to identify areas that are most vulnerable to coastal change hazards including beach and dune erosion, long-term shoreline change, and sea-level rise. Studies in the Delmarva Peninsula have demonstrated that groundwater in shallow unconfined aquifers near agricultural lands is susceptible to contamination from chemicals applied at the land surface. Ten Mile Creek is a small, predominantly agricultural and forested watershed located to the west of Clarksburg, Maryland, in an area that has experienced land-use change and urban development over the past decade. Additional development extending into the Ten Mile Creek watershed is planned over the next several years. Major releases of chlorinated benzenes and benzene are known to have occurred at the Standard Chlorine of Delaware Inc. Superfund Site from 1966-2002, resulting in contamination of the groundwater underlying the site and the wetlands surrounding Red Lion Creek. Coastal Monitoring Tide Gage Sites in Maryland, Delaware, and Washington, D.C.
Vital coastal storm-tide information needed to help guide storm response efforts following major storms affecting Maryland will be more accessible than ever due to a new monitoring network the U.S. Geological Survey is currently building. The NWIS mapper provides access to over 1.5 million sites contained in the USGS National Water Information System (NWIS), including sites where current and historical surface-water, groundwater, springs, and atmospheric data has been collected. Users can search by site type, data type, site number, or place. Interactively explore assessment summary information for continuous (unconventional) assessments conducted at the USGS from 2000-2018. The assessment results data used to generate this visualization can be downloaded here in Excel Format. These data represent all assessment results for Continuous Assessments only from 2000-2018. Analysis of organochlorine pesticides and polychlorinated biphenyls (PCBs) in northern cardinal eggs from six neighborhoods near Washington, DC. The National Water Information System (NWIS) web application provides access to real-time and historical surface-water, groundwater, water-quality, and water-use data collected at approximately 1.5 million sites across all 50 states. The USGS Flood Event Viewer (FEV) is the public data discovery component of the Short-Term Network (STN) database. Data viewable and downloadable from this page are from the STN database. This application integrates with the USGS National Water Information System (NWIS) database for display of time-series water data. USGS data portray selected structures data, including the location and characteristics of manmade facilities. Characteristics consist of a structure's physical form (footprint), function, name, location, and detailed information about the structure. The types of structures collected are largely determined by the needs of the disaster planning and response and homeland security organizations. Boundaries data or governmental units represent major civil areas including states, counties, Federal, and Native American lands, and incorporated places such as cities and towns. The National Hydrography Dataset (NHD) and Watershed Boundary Dataset (WBD) are used to portray surface water on The National Map. The USIEI is a comprehensive, nationwide listing of known high-accuracy topographic and bathymetric data for the United States and its territories. The project is a collaborative effort of the USGS and NOAA with contributions from other federal agencies. The inventory supports the 3D Elevation Program and the Integrated Ocean and Coastal Mapping effort. This resource is updated in Spring and Fall. This map shows the provinces assessed by the USGS for undiscovered oil and gas resources. The 3DEP products and services available through The National Map consist of standard digital elevation models (DEMs) at various horizontal resolutions, elevation source and associated datasets, an elevation point query service and bulk point query service. All 3DEP products are available, free of charge and without use restrictions. This is a graphic from the USGS National Oil and Gas Assessment Explorer application, which allows user to drill into 70 oil and gas assessment provinces throughout the United States. This Indian Space Research Organization LISS-3 image of the Delaware Bay and Chesapeake Bay region, acquired on January 25, 2017, shows the landscape along the densely populated U.S. East coast. Ecosystems and sea-level rise are among the regional landscape changes that satellite imagery helps to monitor. Washington Monument in DC, with the cherry blossoms in bloom. Anna Ormiston and Jesi Hessong, student contractors with the USGS Amphibian Research and Monitoring Initiative, or ARMI, display several discarded mylar balloon collected by field teams working in and around the Capital Region National Parks in the summer of 2015. They collected a total of 71 balloons. In this view from the Washington Monument, the Old Post Office Pavillion can be seen in the center of the image, surrounded by the red-roofed Federal office-buildings of the Federal Triangle. The District of Columbia War Memorial commemorates the residents of DC that served in the First World War. It's made of marble and concrete and sits in the National Mall. USGS laboratory in Washington DC where water samples 1883-87 from Yellowstone National Park were analyzed. Photograph, USGS Historical Photography Library. A regional assessment of untreated groundwater in the Northern Atlantic Coastal Plain aquifer system in the eastern United States is now available from the U.S. Geological Survey. Threats to groundwater availability and sustainability in the Northern Atlantic Coastal Plain are dependent to a large degree by the type of aquifers used for water supply, according to a new regional assessment by the U.S. Geological Survey. Much of the coast from Maine to Virginia is more likely to change than to simply drown in response to rising seas during the next 70 years or so, according to a new study led by the U.S. Geological Survey. Today, the U.S. Geological Survey and the U.S. Environmental Protection Agency announce Visualize Your Water, a citizen science challenge for high school students who live in the Great Lakes basin and Chesapeake Bay watershed.